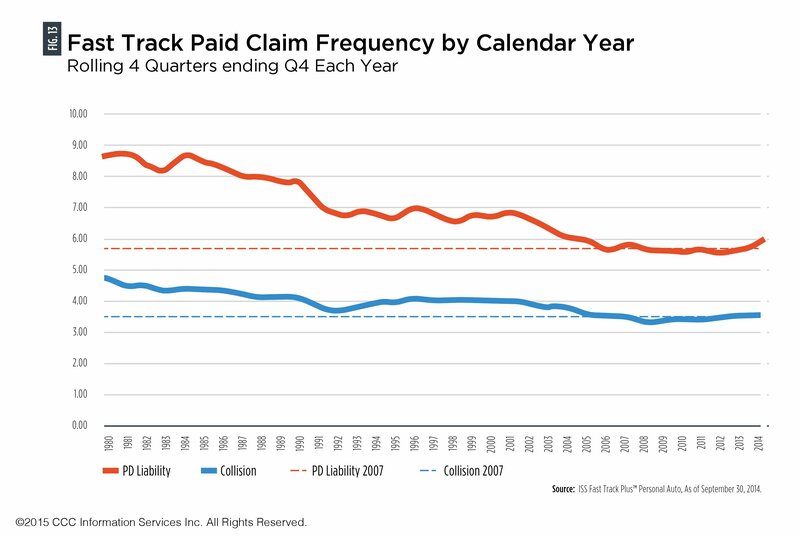 Though collision claim frequency rose in 2014 back to levels before the recession of 2007-09, the number of policyholders opting for $750 or higher deductibles is continuing to grow, CCC found, describing a trend with the potential to cut into collision repair business. The proportion of policyholders with $750-$999 deductibles in 2014 was 10 times that of 2001, and the percentage of drivers with $1,000-plus deductibles more than doubled in that period, CCC wrote in its annual report released Thursday. Now, while $750 in 2014 dollars only cost $561 in 2001, that 34 percent inflation probably didn’t drive those kinds of dramatic shift in consumer habits. Even the number of new vehicle owners (CCC defined it as the past three model years) with $1,000-plus deductibles also doubled since 2001. Consumers’ shift to higher deductibles — likely driven by not only the recession but also insurers’ intense competition for those looking for bargain premiums — could impact collision repair. A $750 deductible means a customer had to eat more than a quarter of the 2014 $2,685 average repair appraisal CCC calculated — and that amount rises to more than 37 percent of the cost if you’ve got a $1,000 deductible. At that level, consumers might skip or be unable to afford some collision or comprehensive repairs. That’s particularly a problem if a driver is low-income and can’t afford to replace the vehicle either. Or they never had anything but the mandated liability — as CCC observed happened more frequently during the recession — which means a crash or catastrophe could put them in a tougher vehicle situation. Newer-model-year owners still get collision and comprehensive as well as the required liability coverage, CCC found, and those policyholders will tend to file a claim since they’re covered. 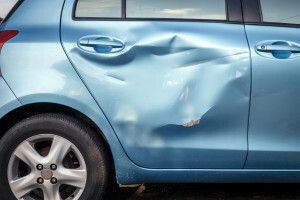 “However, an increasing number of newer model year vehicles now have $1000-plus deductibles, so consumers may opt to pay out of pocket or live with the damage when a vehicle has minor damage, only making a claim when the damage is significant,” CCC wrote. 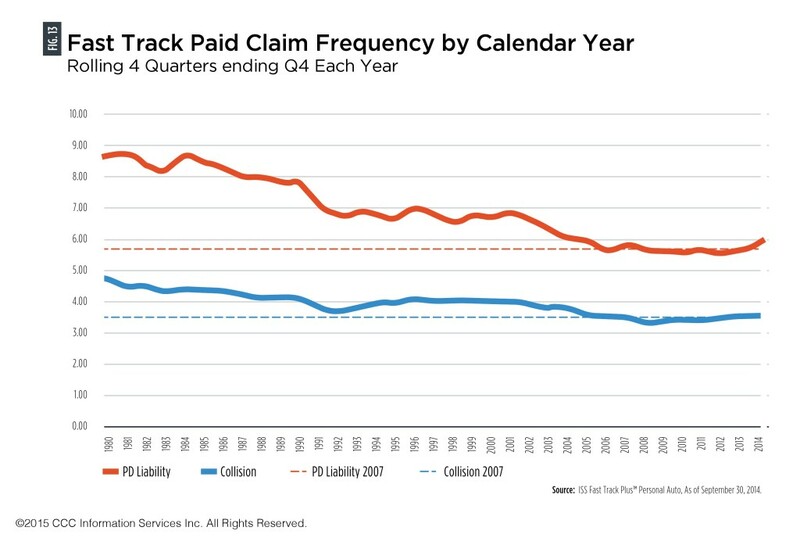 Despite the increase in collision claims in 2014 CCC described, citing ISS Fast Track Plus data of Sept. 30, 2014, the estimator said claim volume was ultimately destined for a fall. “Subsequently while the automotive claim and collision repair industries have finally returned to a market without a recession hangover, the longer term trends still point to a slowly but steadily shrinking marketplace,” CCC wrote. Besides consumers’ opting for higher deductibles, these trends included more cars than drivers (Why fix a car if your household has a backup?) driving fewer miles overall, a population that’s getting older and more rules and time for problematic teenage drivers to get a license. On the plus side for auto body shops, average repair costs are growing over factors like more complicated OEM parts (Read more about that here and here). Car buying has also increased lately for reasons including lower gas prices, which means more newer vehicles that the driver might want to cover with more than liability.